Examining Figure 5.1, we see a variety of space structures (facilities) that are unique to each facility's function. In time that is probably the norm for space facilities. In reality we are just beginning because there is no existing space infrastructure. At best there are specific mission to specific orbital assets (such as a shuttle mission to Hubble). As published in the aerospace literature, the current European (Columbus Laboratory) and Japanese (Japanese Experimental Module, Kimbo) laboratory modules for the Space Station needed over 5 years to complete and large financial expenditures [NASA, 2003b]. These have now been delivered by the Space Shuttle to the Space Station. The Columbus Laboratory is a 4.5m (14.75ft) diameter cylinder 8 m (26.25 ft) in length, and has an 11,000 kg (24,500 lb) mass on orbit. The JEM is similar in size and mass, and has an additional feature, a ramp extension exposed to the space environment for space experiments. Existing orbital facilities are expensive and require visiting vehicles to conform to standards and requirements based on vehicle and facility idiosyncrasies. There is not a consistent set of standards and requirements in sync with the commercial industries. Eventually the transportation vehicles will provide the requirements for the orbital facility, including support of the transportation cycle like airports do. Commercial platform markets include transportation-related support services, habitation and in-space service industry support. The most economical space facility ever flown was the United States Skylab. It was a Saturn S-IVB stage modified for habitation and launched empty. Instead of being the prototype of future space structures for the initial phase of infrastructure building, it was summarily and unwittingly permitted to decay from orbit and burn up in the atmosphere. Skylab was put into a 435 km (235 nautical mile) orbit at an inclination of 50 degrees [NASA, 2003a]. Skylab was in orbit from 14 May 1973 to 11 July 1979 (6 years, 5 months and 25 days). It was launched empty, and was sent crews via a Saturn rocket and an Apollo capsule. There were three missions to crew Skylab: Skylab 2 for 28 days, Skylab 3 for 59 days, and the final Skylab 4 for 84 days, for a total of 171 days occupied. The last crew departed Skylab on 8 February 1974, just 8 months and 26 days after being put into orbit. So Skylab remained unused for over 5 years. Unfortunately there was no mechanism to maintain Skylab in orbit, and on 11 July 1979 it entered the atmosphere over Australia. Again, instead of being a prototype for an economical first step into orbital stations it was a one-of-a-kind only. The next philosophical path taken was then to create an "optimum" space station, the "perfect" creation of NASA, that took almost 26 years before another American astronaut crewed a United States orbital station. In that time period the former Soviet Union placed seven orbital stations into orbit, ending with the orbital station MIR. Figure 5.24. An orbital infrastructure station fabricated from discarded Shuttle main propellant tanks with a Space Shuttle docked for resupply. after it has achieved 99% of full orbital velocity. This means significant energy is invested in the external tank, only about 260 ft/s (79 m/s) short of orbital velocity. With a very small investment the external tank (ET) could be placed into orbit, and become the building block for orbital facilities other than the International Space Station, at a fraction of the cost. At one time the government was encouraging organizations to put this empty space asset to a useful application [Commerce Business Daily, 1988]. One of the individuals taking this seriously was Thomas Taylor, CEO of Global Outpost. He and his company have championed the salvage of the external tank for over two decades, [Taylor, 1980, 1998; Gimarc, 1985]. Global Outpost developed a salvage method using the Space Shuttle with NASA assistance. Global Outpost has won the right to "five ET's in orbit at no cost'' and has worked out a salvage procedure with NASA [Global Outpost Inc., 1993]. 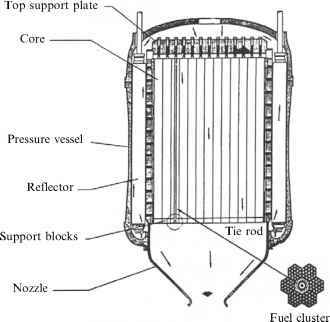 The concepts shown in Figures 5.24, 5.25 and 5.27 are based on concepts developed by Thomas Taylor and Global Outpost Inc.
(1) The external tank could be used as it was intended to be used, as a hydrogen/ oxygen propellant storage facility, using the orbital refueling launchers to supply propellants on a scheduled basis. The tank could accommodate 8.8 19-ton propellant deliveries by the orbital propellant tanker. Figure 5.25. An orbital infrastructure station fabricated from discarded Shuttle main propellant tanks with a hypersonic glider resupply spacecraft analogous to MDC model 176.
diameter hole permitting the use of 55,00 ft3 (1,557 m3) of the interior as a hangar for the OMVs. 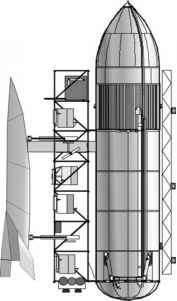 (3) Just as with the Saturn S-IVB stage, the external tank could be launched, with some modifications so that at least one external tank could accommodate a human habitat. This modification is the basis for the sketches in Figures 5.24, 5.25 and 5.27. 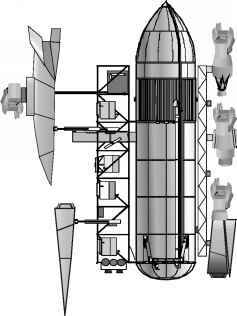 (4) An inflatable habitation structure is possible using the TransHab Consortium 8 m (26.25 ft) diameter 8.2m (26.90 ft) long inflatable structure [Internet, 2000], to fabricate a volume transported uninflated in a sustained-use space launcher described in Chapter 3 and inflated on orbit. The habitat is capable of resisting high-speed particle impact and providing environmental controlled life support interior [Internet, 2003a, 2003b]. Habitation requires cargo and passenger services. Each new industry will require cargo in both directions. The change from one type of transportation to another has always evolved into major commercial centers of industry such as harbors and airports. Emerging commercial spaceways expand the capabilities around the Earth and then to the Moon. Transportation is a major factor. The cost reduction stimulates the accelerated growth and expansion. Harbors start small, grow and reach out to their customers with docks and wharfs; the space harbor is no exception. The external tank modified for crewed habitation and an equipment and parts storage facility as conceived by Tom Taylor [Taylor, 1980] is shown with the NASA Space Shuttle docked with the crew transfer structure deployed between the Shuttle air lock module and the external tank (Figure 5.24). This mission could be for an equipment/parts resupply mission, for crew rotation, or as a mission adjunct. However the Shuttle has a limited useful operational life and must be replaced by a sustained flight rate spacecraft. The one actually designed for that purpose (for the USAF MOL in 1964) was the Air Force Flight Dynamics Laboratory FDL-7 C/D and the McDonnell Douglas derivative, the Model 176. The modified external tank shown in Figure 5.24 is shown docked with the crew transfer structure deployed between the FDL-7 C/D or MDC Model 176 air lock module and the external tank (Figure 5.25). As before, this could be an equipment/parts resupply mission, crew rotation, or as a mission adjunct. The concept of a Space Cruiser introduced in Chapter 2, Figure 2.27, enables the external tank to take on the role of a maintenance, repair and orbital transfer center, much as that developed by the Parks College design team [Shekleton et al., 2002]. The Space Cruiser dates back over 20 years. The authors first were aware of the concept when one of the authors was manager of the McDonnell Douglas Aerospace Vehicle Group in 1983. Mr Redding visited the author and briefed him on the Space Cruiser concept. 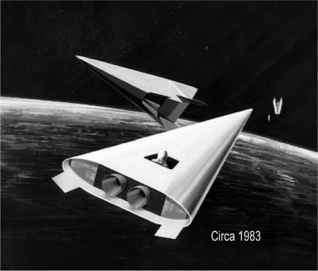 As originally conceived in 1980, the Space Cruiser was a low-angle conically shaped hypersonic glider similar to the McDonnell Douglas Model 122 (BGRV) experimental hypersonic vehicle that was flown in 1966 [Hallion, 2005]. As initially conceived, the Space Cruiser length was 26 feet and could be folded to a 13.5 feet length (see Figure 5.27). Redding adapted the design to incorporate an aft plug nozzle cluster configuration and storable propellants to create 13.3 kN (3,000 lb) of thrust. The 4,453-kg (10,000-lb) vehicle was to perform a variety of missions using the 8 cubic foot forward payload bay and the 4 cubic foot aft payload bay. The Space Cruiser is capable of atmospheric entry and uses a small drogue parachute at Mach 1 followed by a multi-reefed parafoil to land safely on any flat surface. The Space Cruiser was intended to be operated by a pilot in a space suit [Griswold et al., 1982]. 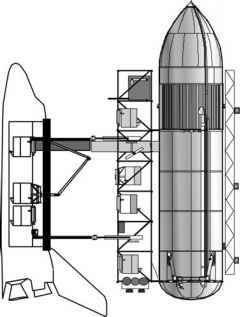 In 1983 Redding modified the configuration to an elliptical cross-section thus expanding the propellant quantity, as shown in a 1983 McDonnell Douglas Corporation Trans-Atmospheric Vehicle (TAV) artist illustration (Figure 2.26) [Redding et al., 1983; Redding, 1984]. Mr Redding formed an organization shortly before his death to preserve the work on the Space Cruiser and seek future development, the In-Space Operations Corporation (IOC). Figure 5.26. ''Bud'' Redding Space Cruiser launched from a trans-atmospheric vehicle to accomplish a satellite repair. Figure 5.27. An orbital infrastructure station fabricated from discarded Shuttle main propellant tanks with docked In-Space Operations Corporation (IOC) Space Cruiser, a hypersonic orbital plane change vehicle, and OMVs. volume and greater capability because the propellants are now cryogenic hydrogen and oxygen with magnetic refrigerators to all but eliminate propellant losses. These, like all the orbital maneuver vehicles are automatic control vehicles that can carry crewmembers when necessary. In this figure, the salvaged external tank is an operations center for orbital maneuver vehicles necessary to move satellites, provide on-site repair and maintenance and non-functioning satellite removal. Has the japanese space shuttel docked safely?